Diligent readers of our small blog series are already aware of the blending feature that darktable offers as part of many modules. Instead of just handing over their result to the subsequent module in pixelpipe, “blending modules” take a moment to reconsider. Based on the blend setting they will take their original output together with their input and do a re-processing. 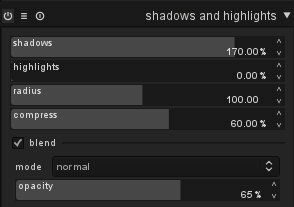 As an example refer to here, where we took blend mode “overlay” with module “lowpass” to do shadow recovery. 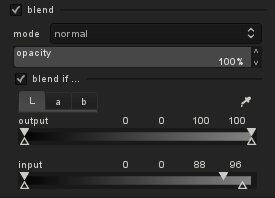 In many cases it is the most basic blend mode “normal” that we want. Depending on the setting of slider “opacity” this allows to control the strength of a module’s effect. Think of this as a layer of two transparencies. The lower one represents the input image, the upper one is the original output of our module (the one we would get without blending). If opacity is 100% the upper layer will completely mask the lower one; you get the full effect of the module. If opacity is 0% the upper layer is completely transparent, you see the input image as if the module has no effect. In-between opacity values allow to gradually blend the effect of this module into the original image. We already used this technique here to tone down the effect of shadow recovery. The opacity slider already gives us some very nice control. However, there are cases when this is not enough, because we want to limit the effect to certain parts of the image. Obviously we could do this based on geometrical coordinates on the image plain. A corresponding method using layer masks is currently under development in darktable. Today I want to present to you an alternative technique available as a development branch in git called “blendif” (soon to be integrated into master for the new development round after darktable 1.0). This one does not use geometrical but color coordinates to control blending effects. With each of up to four color channels, both independently for the input image and the output image, we can decide to what extent pixels should be blended or not. As this is done with four parameters for each channel, you are in the position to juggle with up to 32 values. This gives a lot of power for a very detailed control, but it might at first appear a bit complicated. Don’t be afraid; we look at it step by step and you will quickly become comfortable with it. Enter a module that supports blending, like “tone curve”, and activate blending with the corresponding checkbox. You see the already familiar controls (blend mode, opacity) plus a new checkbox that says “blend if …” If you toggle that box, a further control area appears beneath. You find a row of notebook tabs named after color channels: “L”, “a” and “b” for modules that act in Lab color space; “gray”, “red”, “green” and “blue” for modules that work in RGB color space. Gray is just a weighted average of RGB and acts as a measure of lightness (gray = 0.3 × red + 0.59 × green + 0.11 × blue). In its default settings the markers are at the extreme positions left and right of the slider. That means all possible values lie between the two filled triangles and there is no room for values outside of the open triangles. So all pixels are subject to blending with 100% opacity, no pixels are excluded (with the exception of “unbound” values, but that is a different story). You can drag the sliders around with a left-click of your mouse, moving first the upper markers inwards. After that it is also possible to move the lower markers more inwards. The sequence of the markers always remains unchanged: they can touch but they can not switch position! To make all this a bit clearer let’s look at an example. Below we have a slider of an input L-channel with one potential configuration. The left open marker is at L=20, the left upper marker at L=40, the right upper marker at L=60 and the right lower marker at L=80. The numerical positions of the markers (from left to right) are displayed above the slider. 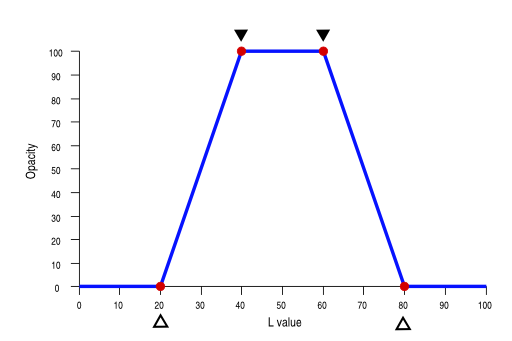 L values between 20 and 40 and between 60 and 80, respectively, are gradually blended using an opacity that linearly changes between the markers. OK, with this tool we now are able to define a per channel opacity depending on pixel value. How is the situation, if we do this for different channels at the same time? For each pixel the per channel opacity value is calculated and all of them are finally multiplied. This product, together with the global opacity value, defines the effective opacity of a pixel. This implies: if one of the channels has a per channel opacity of zero, e.g. for L=10 in the above example, the overall opacity will be zero regardless of the other settings. Blending will then cause the respective module to have no effect on that pixel; we just see the unchanged input pixel. Only if all channels for a certain pixel deliver 100% opacity (and global opacity is also set to 100% as well) the module will have full effect for that pixel. Some more words on how to control the markers. As we’ve seen, you can drag them around with a left-click of the mouse. The marker you touched last is selected and highlighted. You can fine-tune its value with your scroll-wheel. Right-clicking will select / deselect a marker for fine-tuning. Double clicking will reset all markers to their default positions. If you want to know, what Lab (or RGB) values a certain point of your image has, activate the color picker tool and drag around in the image. The corresponding values are marked in the gradient sliders as a white bar and displayed numerically above the slider. Obviously the positions of that bar can be different for input and output sliders; that’s just the consequence of the module’s image processing action. If you change the color picker into “area” mode, you will additionally see in each gradient slider a gray field that shows the range of values from minimum to maximum. Let’s go for a practical example now. 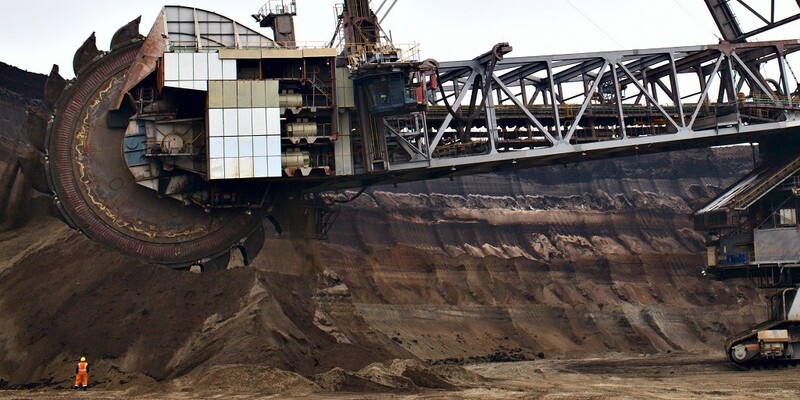 I took the following image in the open-pit mine “Garzweiler II” close to Cologne. 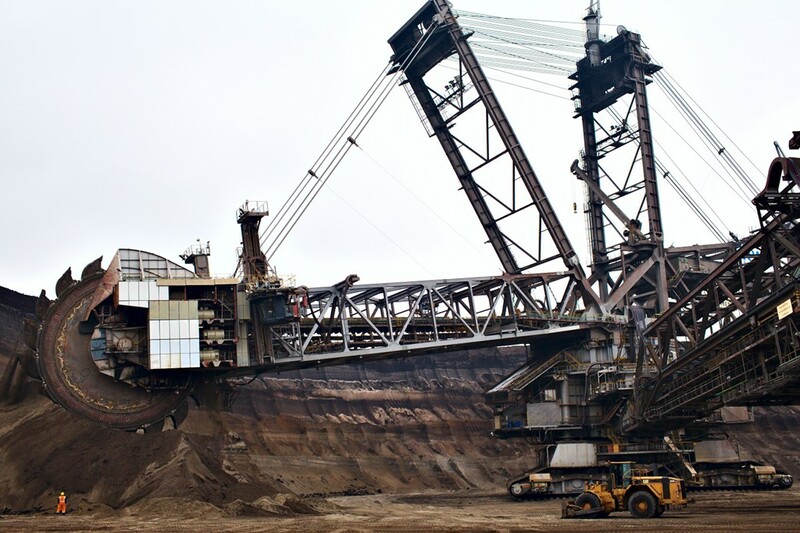 Shovel-wheel excavator “288” with its 13000 tons is one of the biggest machines you might find. I was happy enough to have one person standing close to the running shovel-wheel to give us an impression of the size. This version of the image is pre-processed with modules “exposure, “crop and rotate”, “equalizer” and “non local means”. … well, just ridiculous! The safety garment of the worker displays an orange, you will never find in reality. Also the color of the Caterpillar® in the foreground is completely exaggerated. As a general rule: if you work on colors, play close attention that you correctly hit colors which everybody knows: corporate colors of well known companies, colors of traffic signs to name just a few, and most important skin tones. Another possible use of conditional blending is to prevent artifacts which might hit us when using certain modules. 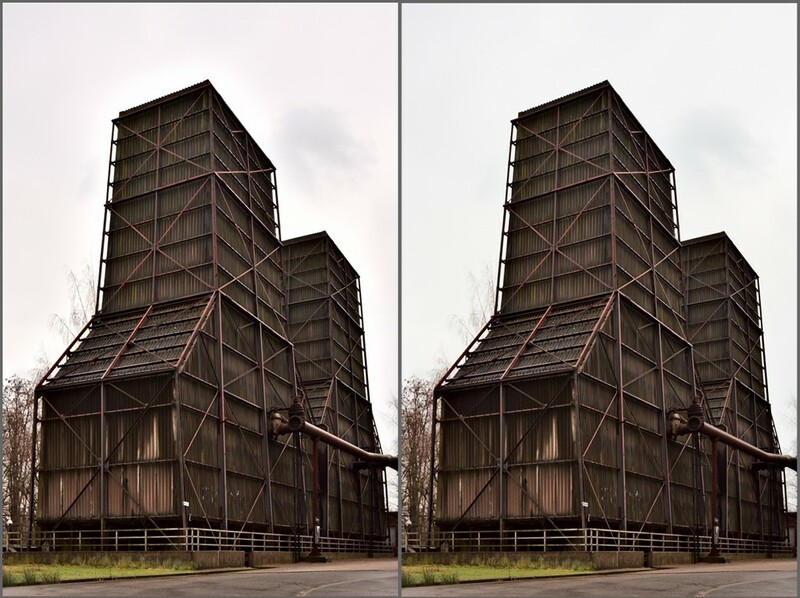 Here is an example of a photo of two old cooling towers. A typical situation in photography: rather dark main subject contrasted by a light sky. I exposed for the sky and hoped for post-processing to do the rest. My history stack contains several modules, including “shadows and highlights” to bring the tones of the cooling towers to where I wanted, “equalizer” to emphasize the structure, and “tone curve” to boost the colors. Unfortunately some modules, in this example mainly “equalizer”, can produce artifacts in high contrast edges of large structures. Look at the left example and pay attention the sky close to the roof of the structure: a light halo is visible. In the right example I restricted the effect of modules “equalizer”, “shadows and highlights” and “tone curve” only to the dark to mid tones, keeping the light tones of the sky unchanged; the halo is gone and the sky keeps its neutral color. You should have gotten the point now. In general the most important step is to find a strategy how to select those pixels you want to save from the original image or you want to get processed from the respective module. Some cases are difficult to solve with what we’ve discussed so far. For example, we might want a module to act on the major part of an image but exclude a minority of pixels which are defined by a very narrow band of values. For this purpose a new blend mode “inverse” has been introduced. 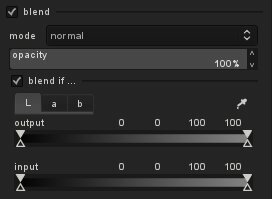 It behaves like blend mode “normal”, only that the logic of what is blended with 100% opacity and zero opacity, respectively, is reversed. Give it a try to find out how it works! Finally a small exercise: one reader has detected in one of my earlier blog posts an artifact. I leave it to you to propose a way how to avoid the bluish tint of the rocks in the brook bed. Anyone? THIS LOOKS GREAT!!! Darktable never ceases to amaze me! I love how, (not beign a commercialy driven software? ), you afford to take a technical/scientifical approach to raw processing to give so much controls to the end user. Darktable's Equalizer (and DT in general) is already awesome but still getting better ? way to go ! It reminds me of the "color selection" feature from LightZone. Like in lightzone it would be very good if you could provide a preview of the selection that is accomplished, e.g., by providing a gray map of the image, with white pixel showing the selected pixels etc. It would be nice to have a copy mask feature. Often you find that you want to apply the same mask to different tools. Also, when you have a selective way to apply one tool, you also find that you may want to have different instances of the same tool, i.e. apply different equalizer setting to different color selections. I still like the approach taken by LightZone there; I can have a user defined tool stack, where each tool can appear multiple times, with different selections and different parameters. I love darktable. Keep up the good work! Thanks a million, I have been waiting so long for the sort of flexibility this gives. I finally weakened and installed from git rather than just using the unstable PPA so I could get this- and boy am I impressed, even after just 5 minutes use. I have tried the equaliser with subtle vibrance a few times but (to my eyes) sometimes find it a bit harsh on highlights. Now just blendif, set the 100% mask down just enough to get rid of the harsh highlights and the o% mask slider somewhere in the dark midtones for a gradual transition and the image is totally transformed. I love it, and that's just from an initial experiment. Impressive and potentially more useful than masks. - I second the selection preview in a greyscale thumbnail similar to e.g. the yellow highlights for zones. As several users have requested I added an option to display the virtual blend mask as a yellow overlay. I think it's quite obvious how it is used. Please give it a try and report bugs. You will find it in branch blendif. This feature only works on cpu path at the moment. Will take a few days to also implement it for our OpenCL path. this is a feature we are working on and which will be available in addition to blendif. Do not expect anything in the near future, we have other features we're focusing on currently.